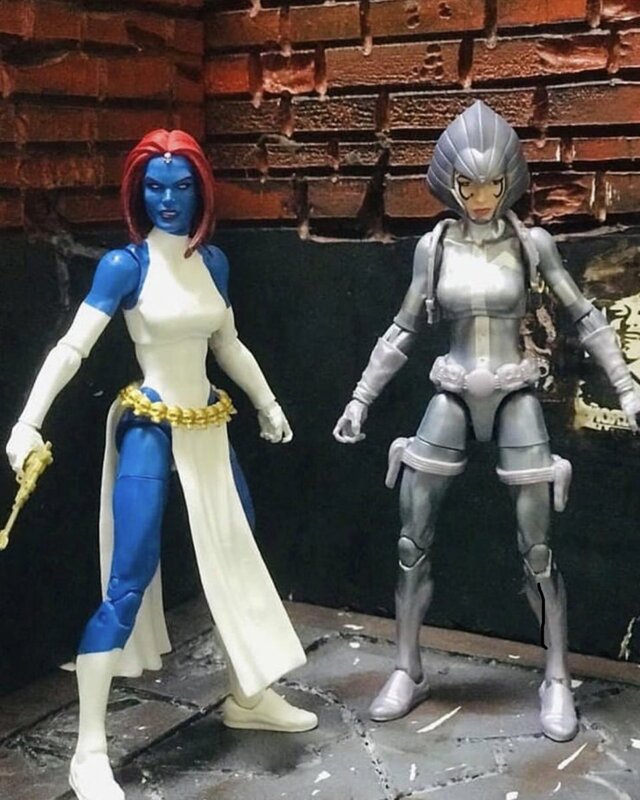 Shown below is a in-hand look at the new Marvel Legends 6" Mystique figure from Hasbro including an image via marvellegendsuk that shows us what the extra Lilandra head that is included with this one and what it looks like on the recently released Sivler Sable body. Here in the US the Mystique figure will be released as a Walgreens exclusive, but the figure is already hitting overseas and available now from our sponsor Robotkingdom. The lilandra head seems so random to me. I don't even know who that is. However, it does look nice on that Silver Sable body. I think once upon a time, it was supposed to be a Ruger MKIV. I already have a Mystique figure...she's just...shapeshifted to look exactly like Rogue...for now. Lol. I agree. Unless the figure has an iconic accessory that isn't present, I'm never really upset with them just putting stuff in the box! Lilandra, I remember her from some of my old 1980's XMEN comics. She was an empress or queen from outer space and was a girlfriend of Charles Xavier. Her sister was a villain but don't remember her name. I already have the old mystique figure but this one is much better. What a beaut: mine's arriving early next week. Are there really people complaining about the bonus heads? Hasbro are unlikely to sell any more Mystique figs as a result of the inclusion of the Lil & transition-to-Rogue alt heads, so these should really be seen as a favour to, and bonus for, collectors: adding value and lifespan to a figure. Plus, one head is for a beloved figure we'll never, ever see single carded (but has been sought by collectors since the Toy Biz day). You don't have to be a master customiser to work out how to make a Lilandra figure with this head and the body of two or three recent, female Legends. And, lastly, the transition/Rogue head is cool & also faithful to many, many canonical X-books. I love the swap heads, and always get a kick out of them: the proper Onslaught head packed with Kitty Pryde (XM Juggernaut wave) instead of the Red Skull/Onslaught head, and even the new Starforce Captain Marvel is worth buying because of the inclusion of a Dr Minerva swap head, hands, rifle and scarf. You've got a whole new character there. Hasbro gets a lot of stuff wrong, but when they get it right (comic waves, responding to fan demand for niche characters, multiple X-Men waves) it's worth shouting about, I think. So for me: good work, Hasbro - more alt heads & more mutants, please. Yeah, okay, broham. Gotcha. Almost didn't see it there in the packaging since the color is so close to the background. Personally I would rather they gave her the sniper rifle from the "Epic Heroes" series, but for some reason that he hasn't made particularly clear, Dwight Stall has said that he wants to use the realistic looking gun accessories as little as possible with comic-based legends, so this is the kind of thing wind up with. My local Walgreens are still swimming in Ant-Mans and Daredevils so I have no hope of ever seeing this on a shelf. That said, I've got my fingers crossed they'll eventually sell it on their website because it looks great and I'd love to have her in my collection. Wow! I am pleasantly surprised that Lilandra's head looks so good on the Silver Sable body! It looks like I'll need to buy a second Silver Sable fig! I've had good luck so far getting the exclusives off of WG's website, which is good since my local WG seems to get these exclusives months after they start showing up elsewhere... and WG is probably my least favorite place as far as toy hunting. Mine sounds like yours except Medusa in place of Ant-Man. Still plenty of yellow DDs. 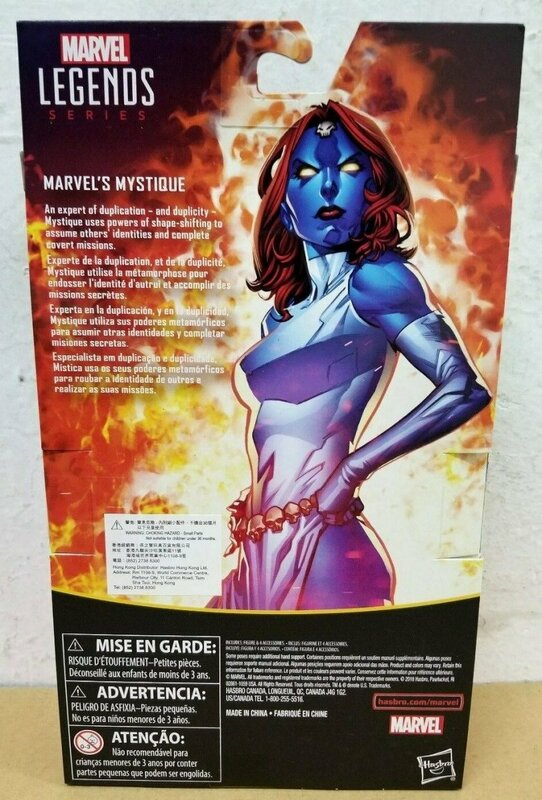 That said, Mystique looks great and i like the accessories they chose to package with her. I wouldn't mind a new Pyro and Blob, either! i suppose destiny and avalanche too although i find them kind of bland-looking, compared to the others. Just got my mp7's that I ordered in anticipation of this figure. I love that she has trigger fingers! I think Hasbro needs to ditch the pistol that she comes with. We have seen it some many times in so many different colors it would be nice to get a new one. Speaking of accessories check out liselome on eBay. They do a variety of gun casts as well as other accessories. I am not affiliated with that ebayer, I have bought many items from them and they are all quality pieces and believe they do a great job of supporting the figure community with their work. I am sooo in for Mystique, presuming I can find her at a Walgreens before she evaporates. However, I am really impressed with the Lilandra head on the Silver Sable body. I had seen some postulation previously that such a pairing would be workable, but pictures do those typewritten missives wonders indeed. I may be in for a Sable now as a result, even if it is imperfect to her comics depiction. I tend to agree we will see a body down the line, but that may be 2 years from now. Hasbro is nailing Marvel Legends and Tranformers these days...too bad they and Disney jumped the shark for Star Wars, else this would be a new golden age, given what NECA is doing also. 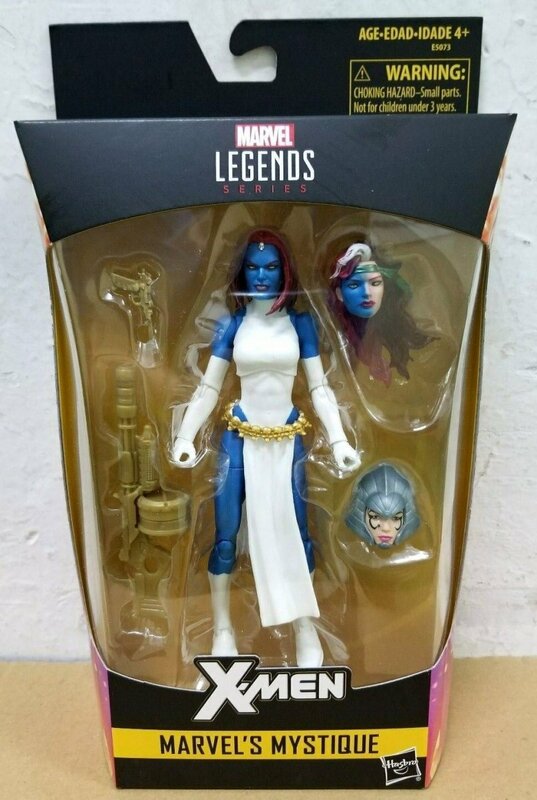 I was really pissed that this Mystique was gonna be a Walgreens exclusive but I just called EBgames a few hours ago and they should be having this by Feb. 15! Spread the news Canadians! You guys still have EB Games? Huh. I'm tired of repeating that I'm tired of Hasbro using that skinny body, or legs. However, Head sculpt is simply amazing, it really captures Raven's personality. I would prefer different face expression instead of Lilandra, but if it's only way to get Lilandra I take it.